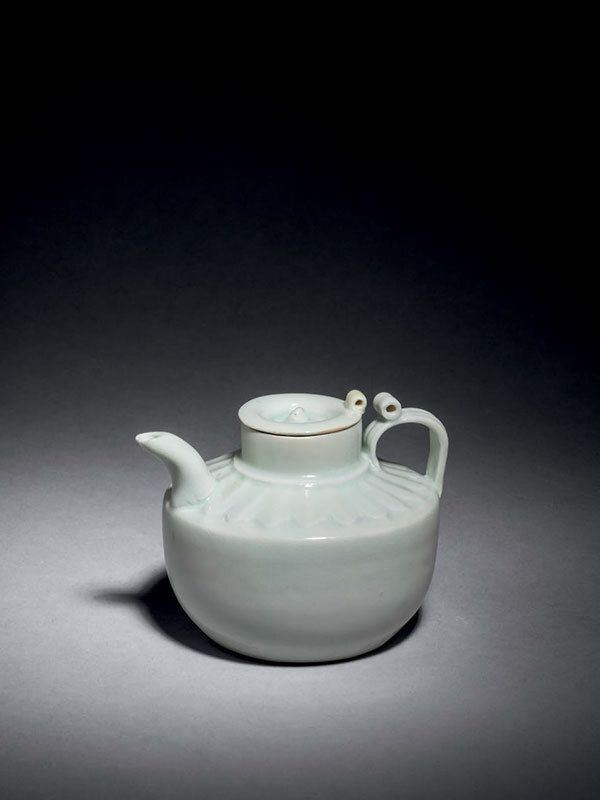 A qingbai porcelain ewer, the well rounded, thinly potted sides rising from a flat base and curving in sharply at the shoulder, which is decorated with a band of moulded, overlapping leaves. A double-strand loop handle has been applied to one side of the body with a short, curved spout opposite. The dish-shaped lid has a bud-shaped finial and a tiny loop to one side, which corresponds with a similar loop on the handle. The porcelain is covered with a transparent glaze of pale blue tone, which darkens in the crevasses of the body. The base is unglazed, showing the fine-grained white porcelain body, and has some characteristic burn marks.